Reduces withdrawal symptoms, including nicotine craving, associated with quitting smoking. Use it 16 hours or 24 hours - you decide! If you smoke: more than 10 cigarettes per day: start with Step 1. 10 or less cigarettes per day: start with Step 2. Includes: 14 patches, Committed Quitters Program enrollment form, user's guide, CD and child resistant disposal tray. What is the NicoDerm CQ Patch and how is it used? NicoDerm CQ is a small, nicotine-containing patch. When you put on a NicoDerm CQ patch, nicotine passes through the skin and into your body. 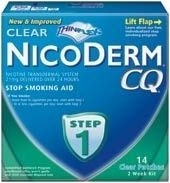 NicoDerm CQ is very thin and uses special material to control how fast nicotine passes through the skin. Unlike the sudden jolts of nicotine delivered by cigarettes, the amount of nicotine you receive remains relatively smooth throughout the 24 or 16 hour period you wear the NicoDerm CQ patch. This helps to reduce cravings you may have for nicotine.